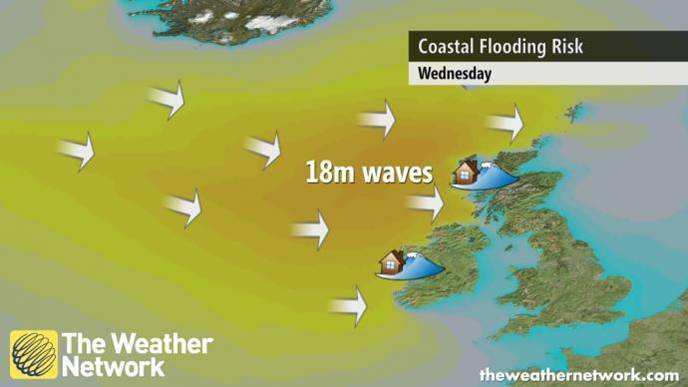 The December ‘weather bomb’ – over-warned or better prepared? Recently the flood forecasting service had to contend with the potential impacts of the so called weather bomb. Explosive cyclogenesis – a weather phenomenon which results in rapidly deepening low pressure – occured to the south of Greenland and gave rise to stormy weather conditions including severe gales and lightning strikes across parts of Scotland. For the forecasting service our primary concern was the potential for coastal flooding with very large ocean waves expected to be generated in the Atlantic. However was the increased flood risk status justified? The weather situation developed as expected, both in terms of the strong winds and the resultant high ocean waves. Forecasts, including our use of a pilot version of the new Met Office wave ensemble forecasting system (see image), indicated that significant wave heights were likely and in the case of the Western Isles, similar to those witnessed in the devastating 2005 storms. Other coastal flood forecasting tools were predicting some minor wave risk and flooding to Loch Linnhe, a moderate surge for the Firth of Clyde and a more significant surge (1 metre) near Cape Wrath, however astronomical tides were relatively low, which helped mitigate any overall exceptional sea levels. Predictions from non operational test wave ensemble system from Monday 8th December for the Cefas WaveNet site off the West of Hebrides. (c) Met Office. As the media interest built up so did the social media reaction to the weather bomb phenomenon. For the flood forecasting service the risk was highlighted some five days out, with likely significant flooding impacts being advised for the exposed western coasts of the Western and Northern Isles two days ahead. The resultant response to the combined weather and flood hazard warnings led to numerous transport services being cancelled, schools being closed on the Western Isles due to the dangerous conditions and a Scottish Government led co-ordination with responders. 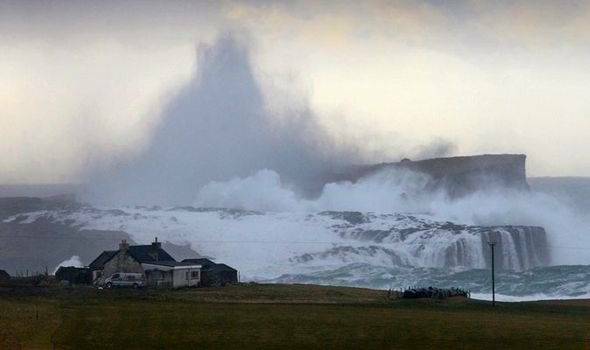 The storms did cause significant disruption in the Western Isles and Orkney, with much of this due directly linked to lightning strikes and the severe gales. The challenge for the forecasting service in these cases remains in the evaluation of potential flooding impacts. Where new approaches to forecasting wave modelling and overtopping in the near and onshore environment have been used, such as the Firths of Moray and Forth, estimates of flood inundation can be provided. However, in the more remote island and coastal zones no direct link between wave height and flood risk has been established. Thankfully this storm passed without any significant flooding with some potential impacts well managed due to effective action of road and causeway closures by responders. The Weather Network joining in the media interest with their infographic for the coastal flood risk on Wednesday 10th December. SEPA issued Flood Alerts for coastal flood risk for the coastline from Dumfries and Galloway up to the Shetland Islands. This entry was posted in Coastal, Forecasting, Risk communication. Bookmark the permalink. 1 Response to The December ‘weather bomb’ – over-warned or better prepared?